Akash Kalita: 5 Dangerous Car Modifications that you should avoid. Blacking-out the headlamps or tail lamps look really cool on vehicles. They add a gangster look to the vehicles. The headlamps which are specially designed with a smoked/blacked-out look are safe to use as apart from enhancement of the aesthetics of the vehicle, they are designed for functionality as well. But these specially designed headlamps cost a lot. A cheaper and more common alternative that is sought into in order to achieve a blacked-out head/tail lamps look is using of window tint film for wrapping lens of the lamp. It significantly reduces the illumination of the lamps by blocking the light. The headlamps will not provide good illumination and hence can lead to an accident. The tail lamps if blacked-out with window tint film reduces the illumination of the brake light and will increase the chances of the vehicle of being not visible to the vehicle behind at night. Therefore, blacking-out of the vehicle lamps with window tint film should totally be avoided. Vehicles with big wheels often look rugged, have that "go anywhere" looks and also have a great street presence. While Slightly bigger wheels than stock can enhance little performance but a set of oversize wheels on a vehicle can drastically reduce its performance and also make it dangerous to drive. The inertia of bigger wheels increases due to its weight and hence the efficiency of the brakes reduce significantly. Also, the suspension and the steering are designed to handle the specified weight of the wheels and tyres so deviation from the specified wheel size can result in poor handling. It is common to see vehicles with raised suspension setups in places where road conditions are not great. While the raised height of the suspension provides better ground clearance to crawl over bad road surfaces. But, increased height of the vehicle shifts the center of gravity of the vehicle and adversely affect the stability of the vehicle especially in corners. The vehicle can roll over if the suspension height is increased to a significant level. While front bull bars can protect the vehicle's few parts like the headlamps, fog lamps and the front bumper it can seriously injure or even get the passengers killed in an event of high impact accident. If the vehicle has the bull bar installed on it then the vehicle's airbags will not be deployed in an event of a crash leading to serious injury of the passengers. Also, bull bars interfere with the crumple zone of the vehicle which leads to direct transfer of the energy caused by the impact into the cabin which causes serious injury to the passengers. Upgrading headlamp bulbs can really enhance illumination if done in the right way. 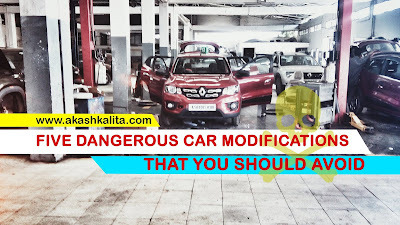 But, it can be a real danger too if not fitted into proper headlamp housing or projector by reducing illumination and blinding the oncoming traffic. So are LED headlamp bulbs really good or bad? ?